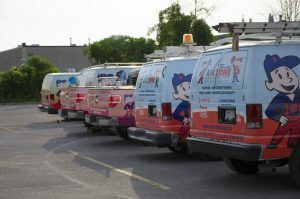 In Ottawa and the Valley, it is critical that your furnace is operating at it’s best. AirZone HVAC Services provides quality repair services for your furnace and complete HVAC system. If you are interested in receiving free diagnostics, check out our protection packages For a low monthly fee, you will receive annual maintenance and a large number of other benefits including diagnostics! We offer two repair services: Regular Service and After Hours Service. If you are able to schedule a diagnostic call during regular business hours this option is for you. We will come out and diagnose any issues with your furnace and recommend the appropriate repairs. Often, we are able to complete the repair on site. Unable to schedule an appointment during business hours? We offer a convenient service allowing our trained technicians to visit and troubleshoot your furnace after hours. Note that our after hours service is different from our emergency service. And remember, our protection packages offer a great value to help reduce the cost of service visits. A furnace has many different parts. The most common parts that need replacement for an older furnace include the heat exchanger, blower, and ignition plate. These parts are essential for proper furnace operation. The heat exchanger is where the combustion of fuel occurs. Air is circulated around the heat exchanger by the blower to warm the air before it enters your ducts. The ignition plate is the part that lights the flame so that the fuel can be combusted. If you have an older heater, you also want to compare the cost of a repair with a replacement unit. With all of the parts to a furnace it is extremely important to have a diagnostic completed by a qualified furnace dealer such as AirZone. We hate to say that some furnace companies in Ottawa use repairs as a way to sell a new furnace to a customer. Our approach is different in that we only recommend a furnace replacement if it is really in the best interest of our customer. We come to this conclusion by examining many factors including age of the furnace, efficiency, potential or needed heater repair costs, and homeowner preferences such as comfort requirements. Our financing programs offer low monthly payments on new furnaces. This payment is offset by increased energy savings especially if your furnace is older than 1o years. We simplify this recommendation for your using a chart to show if it is the right time for a furnace replacement. If you are considering furnace repair in Ottawa, look no further than the experts at AirZone! Alongside our furnace repair services we offer expert advice to repair your complete HVAC system. HVAC stands for Heating, Ventilation, and Air Conditioning and refers to your complete home heating, cooling, and air quality system. We offer honest advice to not only ensure your system is running at it’s best. We fine tune your HVAC system so that all components work together. We put a focus on identifying potential problems such as leaks or blockages in your ducting system, thermostat performance, and other total system adjustments. With a properly tuned and maintained HVAC system in your home, you will enjoy more efficient heating and cooling. Your furnace and air conditioner products will also last longer because a tuned system reduces the stress on each component. Contact AirZone today for HVAC Repair in Ottawa and the Ottawa Valley (including Pembroke).